The first book of its kind written exclusively for children's entertainers. 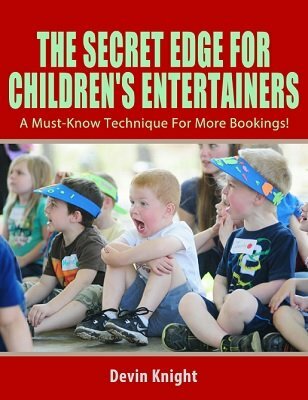 If you are a children's entertainer, then this ebook could be one of the most important things you will ever read. This is not just for magicians, but clowns, balloon artists, face painters, storytellers or anyone who entertains children. It's must-know information. The old saying, "What you don't know, won't hurt you," isn't true when it comes to this ebook. Not knowing this information can hurt your career and cause you to lose children's gig. This ebook tells you how to get an edge that will give you an 80% advantage over your competitors. You will not normally find this edge talked about in other children's entertainer books. By having this edge you will get more inquiries and bookings. No hype here. This actually works. Try it and see. By NOT having the edge you could be losing bookings and gigs. It has happened to many of my entertainer friends. Don't let it happen to you! When you have this edge, people who call you and say they are just shopping around, will most likely call you back to book you, even if someone has a cheaper price! That's because most likely, your competitors don't have the edge. When you have the edge, potential clients will find you to be more appealing and your credibility as an entertainer will go up several notches. This information is valuable and usable most likely in many countries in the world not only in the US, but not necessarily in all (In Italy for example it does not apply). Don't lose gigs because you don't have the edge. Get this ebook and learn how you can have the edge. This ebook fully explains what the edge is, how to get it and how to exploit it to its fullest extent. 1st edition 2016, 14 pages. Devin Knight has focused his lens on an absolutely important and yet sorrily neglected issue that will make a huge difference to all those who aspire to be considered as performers for children. This will definitely determine whether a given performer receives a contract to do a gig. He gives good advice on this, and it could help all child performers who heed his advice. If you want to perform for kids, put down that magic wand right now, and take the time to read Devin's brief and helpful book.